New and improved exciting features were added to the Aquadom Flag Ship model Daytona mirrors. The copper free silver glass mirror was increased to a whopping 5mm thickness for durability and great style. The new Daytona model will feature 3D, Triple Color Temperature Lighting (cool light, warm light, and combination of cool and warm mixed). Each light has a built-in dimmer on it. As always, our LED digital clock comes standard on all the Daytona mirrors. Of course, the Daytona model as always comes with a automatic defogger, so the mirror does not get steamed in the shower. The Daytona mirrors are now available in 12 different sizes, please make sure to view all the available sizes and select the one that suits you best. AQUADOM Daytona boasts several comfort features built in for your convenience. 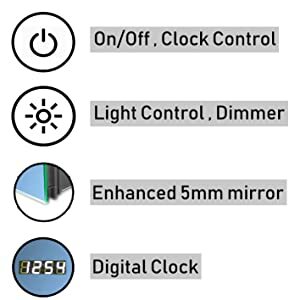 The On/Off button serves as the control for the digital clock. 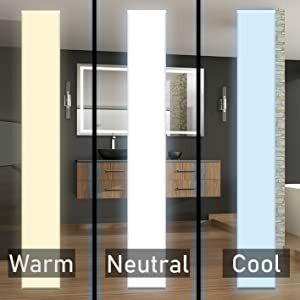 The light control allows you to swap between the three light options available through our 3D lighting tech, as well as adjust the brightness of the light selected. An automatic defogger is also installed in order to keep the mirror fog free and the reflection clean! Anodizing is an electrochemical process that converts the metal surface into a decorative, durable, corrosion-resistant, anodic oxide finish. 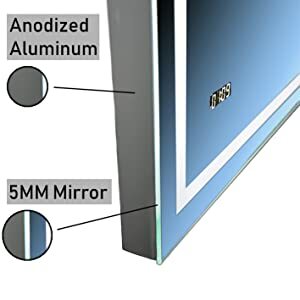 That is why all of our mirrors are made with anodized aluminum. A 5mm mirror is utilized in order to provide you with a crisper reflection.